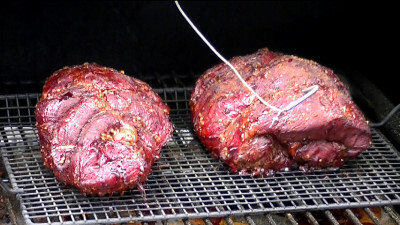 SmokingPit.com - Hickory Smoked Pulled BBQ Beef - Slow cooked on a Treager Pellet grill. 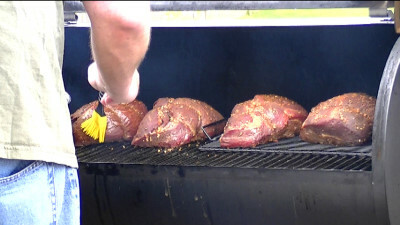 BBQ beef lovers this ones for you! Everything about this smoke is low and slow. Prep time is fairly quick. Most of the time is spent slow smoking in the smoker then the pulled beef is bathed in a sweet tangy BBQ sauce in a Crockpot over night. You will need a flavor injector for this recipe. 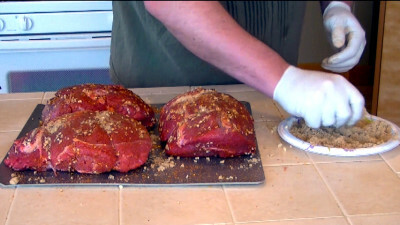 First thing to do is to trim the fat off the outside of the roasts. I like to trim all off if possible exposing the meat to the smoke. Chop a whole garlic and coat the roasts with the chopped garlic. Now shake a light dusting of garlic powder on to the roasts. Shake on some McCormick's garlic and onion medley. Next apply a liberal coat of Jack's Old South Hickory dry rub. Once the seasoning is on, rub some brown sugar into the meat. Wrap the roasts and refrigerate over night (optional). Now we will make the Au-Jus used in the injection processes. In a medium sauce mix 2 packs of Au-jus mix and 5 cups of water. The packets will say 3 cups each but we want a stronger liquid so we will use 5 cups. Bring to a boil then let cool and place it in the refrigerator until its time to start cooking. Now you will inject the meat with a flavor injector. It's highly recommended that you boil the injector and kill any bacteria before injecting. 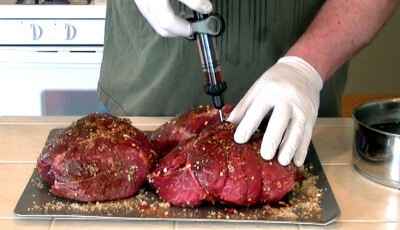 Using a flavor injector, inject the roasts with the Au-Jus. Insert the syringe deep into the meat and start forcing in the Au-Jus as you slowly draw the syringe out. This will evenly distribute the liquid within the injection area. Inject every 2 inches. You will see in the video how I injected my roasts. Once all the roasts have been injected, shake on a little more dry rub. 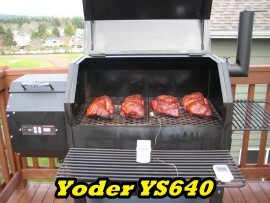 Place the roasts into a smoker preheated to 230 degrees. After 2 hours mop the roasts with Au-jus. When the roasts reach 170 degrees foil them and continue to cook them @ 230 degrees until the internal temperature of the thickest area of each roast reaches 205 degrees. Remove the roasts and let them stand covered until they cool. In a sauce pan empty a full bottle of Sweet Baby Ray's BBQ sauce. Fill the bottle up with Diet Cherry Dr. Pepper and then pour it into the sauce pan with the BBQ sauce. Add 3 tbsp brown sugar. Turn the heat on to high and bring to a boil while occasionally stirring. 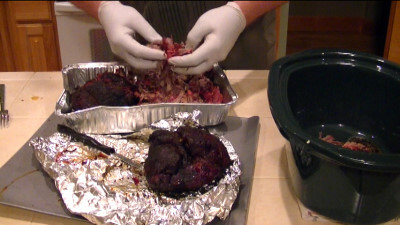 Once the roasts have cooled, you can place them in a aluminum roasting pan one at a time and pull the beef. Since the roast was brought up to 205 degrees it should be very easy to pull. 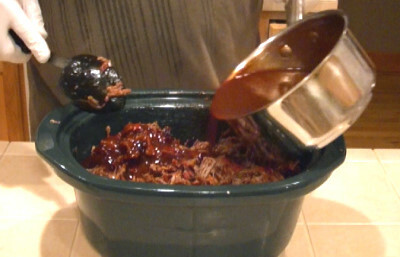 Place the pulled beef in a 5 quart Crockpot as you pull it. Once the beef is pulled, stir in the sauce pan of BBQ sauce. Mix the BBQ sauce and beef thoroughly. Turn on the Crockpot to the low setting and place the lid on. Slow cook the BBQ beef for at least 8 hours. Serve hot on warmed buns. That's it. 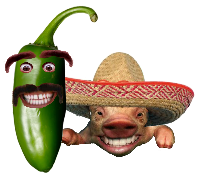 Enjoy the BBQ Beef!